Being the father of a 2-year-old and a high school teacher keeps Keith on his toes. But a November 2014 misstep into his dog's food bowl put him on the ground. "From the moment I fell, I knew it was not going to be a good experience," said 35-year-old Keith. "I looked down at my leg and it was crooked and bowed outward. I could not straighten my leg, but with the help of my wife I was able to pop my knee back in place to relieve the incredible pain that I was in." Keith had dislocated his knee cap and ruptured his medial collateral ligament (MCL). The latter injury wasn't entirely new to Keith, who suffered partial tears to his MCL when he was 16 and 22. Previously, he had avoided surgery with physical therapy. This time, after he dislocated his knee once more doing exercises at home, Keith knew surgery was necessary. But he wasn't looking forward to it. A previous open-heart surgery had led to a recovery process that Keith remembered as a "living hell" And despite assurances that this MCL surgery would be easier, Keith was still overcome with pain. "The first 72 hours of this experience are better off forgotten," he said. "I could not get over how much unbelievable pain I was in." The pain intensified a week after the operation. His pain—and his fear of pain—were beginning to weigh on him. "Honestly, at the age of 35, I was feeling pretty low," he said. "I felt like no matter what I did in my life, some health issue would present itself and take little pieces of my life away." 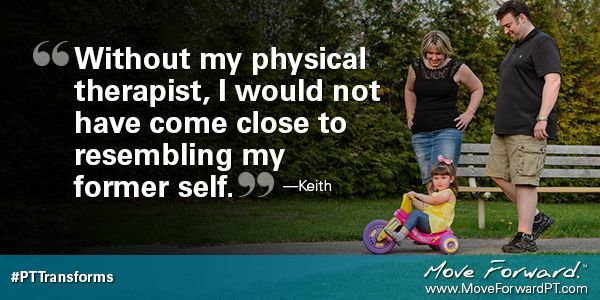 Keith's fears followed him into physical therapy. The surgeon hoped Keith would be able to do a straight leg lift and bend his leg to 90° by their next appointment. But Keith was hesitant, and his initial progress was slow, which only worried him even more. "I was petrified of another surgery [to address scar tissue]," Keith said. But his physical therapist, Megan, "was there to pick up the emotional pieces. Without her encouragement, and my support at home, I could not have done this." Working with Megan, Keith avoided any additional operations, reached 142° in range of motion, and was discharged from physical therapy in July 2015. He has regained his independence and his confidence; he handles stairs comfortably, has returned to running, and he plans to go water skiing in the summer of 2016. "I cannot begin to describe how happy I am that I don’t need crutches all the time, and I can do things, like going grocery shopping with my wife and child, mundane activities that people don't think about," Keith said. "Megan helped me get my life and my confidence back, and is still working with me to put the finishing touches on my recovery. She has helped to put me back together again, and I owe her a debt that I cannot repay."